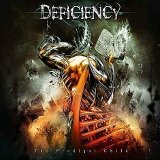 Deficiency's second album, The Prodigal Child, is strongly melodic -- almost to the point of being power metal at times. But it's definitely thrashy -- maybe more thoughtful than angry, but still fast and razor-edged. The French quartet have made a strong album here, though with a few parts I didn't like quite so much. The opening title track is suffused with a smoothly mixed, but fast and cutting set of blastbeats, perfectly synchronized with lead guitarist Laurent Gisonna's solo when it finally arrives at the end of the track. Unfinished, the second track, is better, though, due to a faster, catchier pre-chorus and a fierce, tight dual-guitar set of riffs. What makes these tracks fall flat is when they go mid-tempo and clean-vocalled; the combination of shouted/growled lyrics and clean parts end up sounding generic and manufactured. There's nothing wrong with just sounding rough the whole way through, as they mostly do on A Prospect of Traveling Beyond, which thus stands head and shoulders of the preceding tracks both due to this and the fantastic work from both guitarists. Those Who Behold is also good; a mid-tempo beat through most of the song is prevented from getting boring by a good melody and the clean vocals being overdubbed with a growled version. While occasionally the overall speed of a track might decrease, the riffs always are stuck on one speed setting: High. Deficiency seems to do best when they don't slow down, though; The Flaw, which rarely slows down but has slower riffs, is a better song than the following Stronger Than You, which has much faster riffs but a slow and rather weak chorus. The instrumental A Way Out of Nowhere makes up for it completely; crisp and without any weaknesses whatsoever, it quite simply kills, and so does the final track, The Curse of Hu's Hands. This one is substantially more progressive and has more variety within it than I expected by the end of the album. Sure, Gisonna growls as before, the guitars crunch away, but there are some moments where the drum and bass almost solo on their own, and there are a few bits of piano in this track that the guitars play along with. The Prodigal Child does plenty of things wrong, but gets a lot right, especially on The Curse of Hu's Hands. The hard thing for this album is that it's probably too thrashy to make many power metal fans love it, and probably too melodic to interest many thrash fans -- but if, like myself, one likes both genres, it's worth checking out.